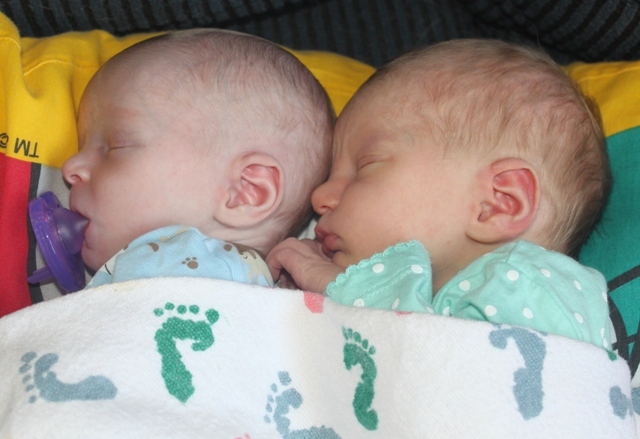 On Wednesday, August 19th we welcomed two new members to our family--Kathryn Paige and Norah Grace. (They are being called Katie and Norah.) Katie weighed 6 lbs. 12 oz. 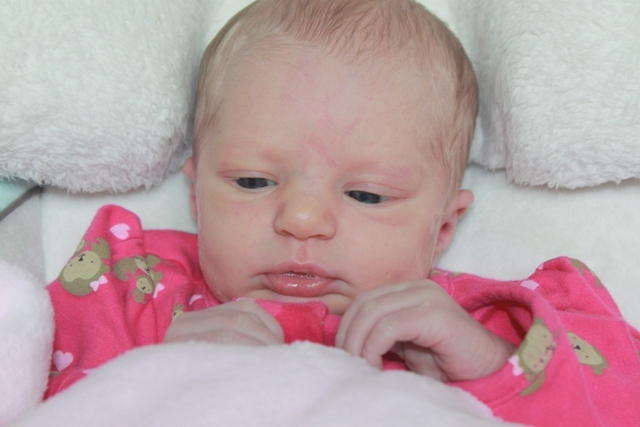 at birth, and Norah weighed 5 lbs. 6 oz. Their amazing mother worked a full day on Tuesday....in fact, she stayed extra to make sure that she had everything covered for the time she would be off with the girls. Here Katie and Norah are with their parents Michelle and Stephen and big brother Garrett. How nice that we each have a baby to cuddle. Here Tom is holding Katie and I'm holding Norah. 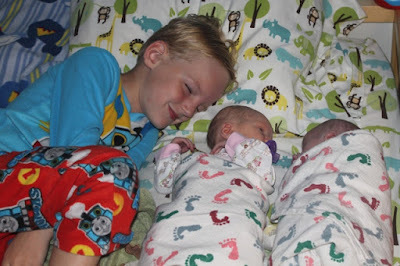 Here's Garrett getting to know his sisters. On Saturday Michelle and the babies got to go home. Here are a couple of photos from the past few days. Their baby samplers are now with my framers. I hope to show them to you soon. We are truly blessed by the birth of these two sweethearts.I'm titling their birth samplers "A Gift from Heaven Above" because that is what I believe they are. Hooray! So glad everyone is well. What special gifts from Heaven indeed! Congrats! Nice healthy weights. Future sampler makers. Such precious little girls! Enjoy cuddling and spoiling them! How very precious! Congratulations to the family! 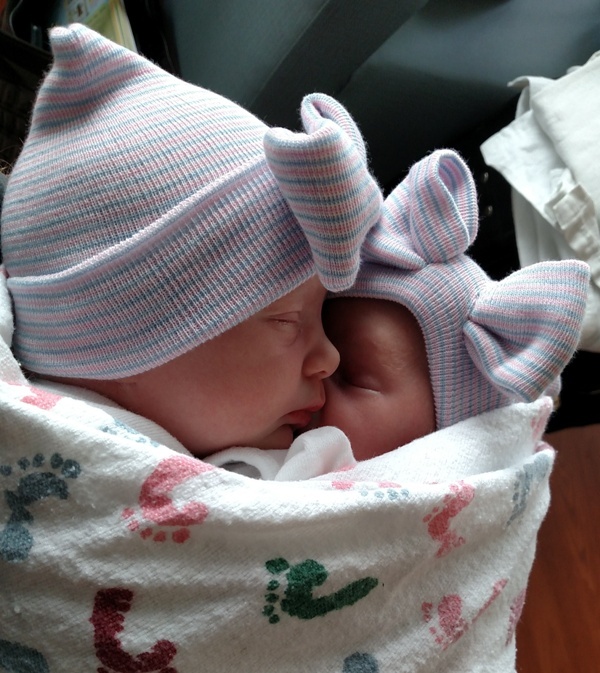 Congratulations, two beautiful little girls. And such a great date to be born (it's my birthday too). How precious. Congratulations to the family! Such adorable baby girls! Congratulations to the entire family. Beauties!!!!!! Huge congrats to you and your family, aren't grandbabies the most fun :-). I'm so happy for your family Ellen. The girls are just beautiful!! You have 2 wonderful little boys and now two special little girls! I have given your trip out here lots of thought and I'll be getting back to you in a few days. The girls are beautiful and Garret looks very proud of his sisters. Glad to hear all are doing well Thank goodness! Congratulations Ellen on the new additions, they look gorgeous. Oh, the babies are so cute. Big brother Garrett, is getting to be a tall, handsome boy. What a blessing you and Tom have. Your family is lovely and growing strong. My guess is Mom and Dad are going to have to run to keep up with them all. 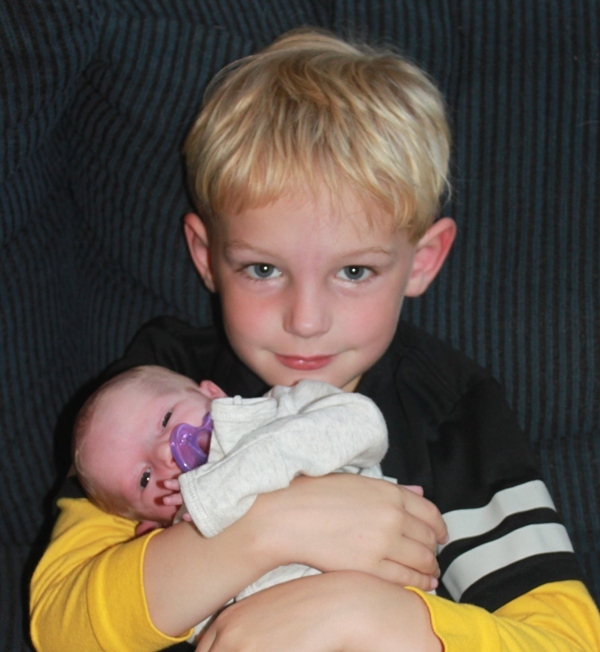 Garrett is going to love having two younger sister, not only now, but when they are older. I know my brother's loved having me in their lives, especially my girlfriends as they got older. My best wishes to you and the entire family. Congrats Grandma! You have two cuties! Enjoy to the fullest!! Congratulations to all! How wonderful and exciting and exhausting! They are adorable and I see Norah was taking it all in, eyes wide open. Congratulations to all the family! What a blessing! Congratulations! They are so sweet!! Oh my gosh Ellen….what an amazing sweet family you have !! Thanks for sharing all the darling pics !! Warmest hugs and congratulations !! Congratulations!!!! They are just gorgeous!!! Glad all is well. CONGRATULATIONS! I'm praying for Mom and Dad and the whole family! 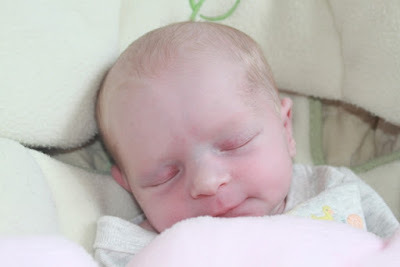 Best blog post that I have read today, What beautiful baby girls and so very exciting! Brother Garrett is adorable. I have a DS named Garrett, born 8/10/87 ~ just got married last month. BEST KID EVER! 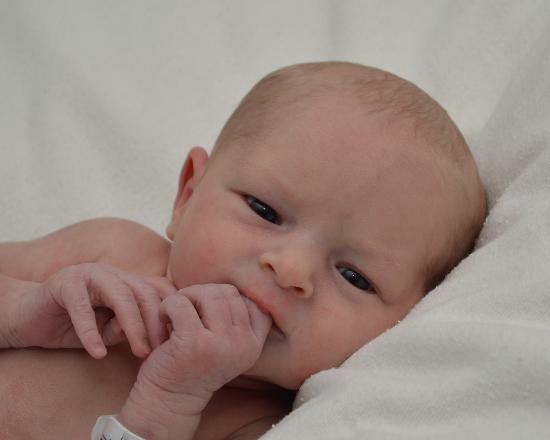 Enjoy your sweet new grand daughters! 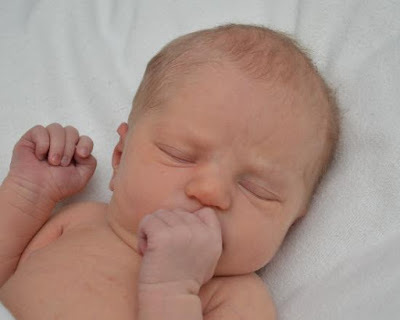 Ellen and Tom: Congratulations on the newest additions to your Family they are beautiful. 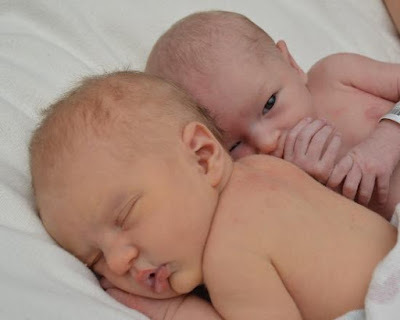 Congratulations on your Precious Blessings♥They are beautiful indeed~! I am very interested in your "Kindred Spirits" kit. I see you just finished a clinic in Seattle; too bad I found out too late. Unsure of any places in Oregon that offer clinics such as yours; Is there a place where I can order it? I would love to participate . Oh, they are so sweet sleeping like angels!